Quite unfortunate that Tsunami is now a household name – due to that black Sunday - that name – perhaps a similar thing only undid Dhanushkodi – and earlier in 1930s …. –the 2004 Indian Ocean earthquake was an undersea megathrust earthquake that occurred at 00:58:53 UTC on Sunday, 26 December 2004, with an epicentre off the west coast of Sumatra, Indonesia - became one of the deadliest natural disasters in recorded history. Indonesia was the hardest-hit country, followed by Sri Lanka, India, and Thailand. Sunday morning usually begins lazily with levity. The residents of Chennai were woken up to a rude shock. It was literally earth shattering. Many did not really know. As written earlier, for few minutes we were mute witness to the commotion – then collected ourselves to do something meaningful. The gravity of the situation was not understood by the curious onlookers on the beach of Marina – in decades, we have never seen sea rushing so long – later pictures were to reveal how a car stationed near labour statue was violently cradled …… but as we waded in knee deep water – we were to hear some sad stories. The city which realized the fury only much later, and after repeated TV footages and many news bulletins started reacting. We at SYMA after the intial shock came to grips and around noon started collecting rice, foodgrains and vegetables. We went around first the mada veethis of Thiruvallikkeni and then extended our trip into smaller bylanes too. The kindhearted authorities of SHG Terapanth Bhavan permitted usage of the choultry and cooking started. Scores of volunteers assisted them, cutting vegetables, and in other possible manner. A team of cooks (professionals and otherwise) – with the support of individuals and likeminded organizations, we were able to provide food for 15,000 and more. The distribution of food continued the next day too. On 1st Jan 2005 when most parts of the World were celebrating, we organized ‘moksha deepam’ lighting of oil lamps – the whole of Kairavini Pushkarini, the sacred lily tank of Sri Parthasarathi Swami temple glittered with lamps lit by hundreds of people, praying for the unfortunate departed souls and families affected by tsunami. Early morning on 30th Dec 2004, we left for Cuddalore in a convoy of a Car, two trucks laden with Stoves, mats, utensil sets, new dress sets, rice bags plus another truck laden with rice/dal of Seva Bharathi, followed by a van full of SYMA and Mangal tirth volunteers. In the midnight, we ended at Thirunagari distributing relief items to the affected people of Mealmoovarkarai, Madathukuppam and Naickerkuppam near Sirkazhi. In between 2000 note books / 1500 pens / 250 slates / 180 Geometry boxes were distributed to school children of Tiruvengadu, Naangur, Poompuhar and nearby. This was coordinated by Embar T. Srinivasan. In the night of 14th Jan 2005, a convoy of two cars, one van and two lorries carried relief material carefully packed. We went to Nagapattinam met people, mingled with them and distributed the material. Chola dynasty known for its valour ruled parts of Southern India for long. Their heartland was the fertile valley of famed Kaveri river – the present day Poompuhar (earlier Kaveripoompattinam or simply Puhar) was once a flourishing port which also served as capital for the early Chola kings. In Purananuru – big ships entering the port, precious merchandise from overseas being unloaded is mentioned. Pattinappaalai describes Puhar in great detail. The fishing hamlets lying closer to the sea were greatly affected by tsunami. There were requests received from this part. Meantime, we were supported by staff of Alahlia Insurance, through a good friend Mr Biju Damodharan. We planned our action in a different measure and in concluding the same, our SYMA team were to visit these places on 26th Mar 2005. After having darshan at the place of Thirumangai Mannan, we went to Thiruvenkadu – reached the carpentry shop of Mr Murthy at Salai veethi. 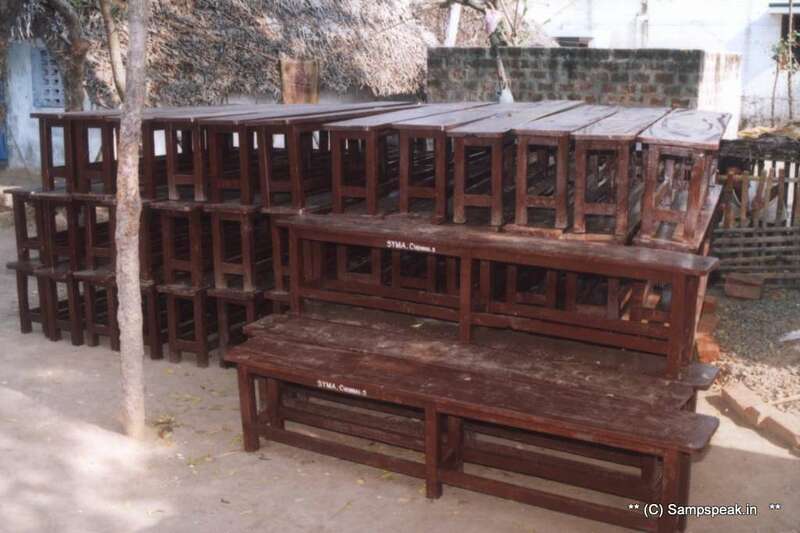 Here 140 benches had been made and kept ready. 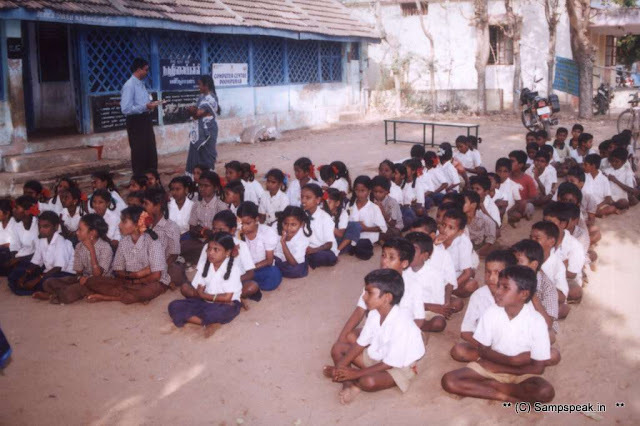 These were distributed to Poompuhar Panchayat Middle High School; Natarajan Govt aided Primary School, Neidavasal; Narayanasamy Aided Prmary School, Kadaikkadu; Poompuhar Middle School, Dharmakulam; Ooratchi Schools at Agani, Thirunagari; Govt High School, Nangoor. We visited Natarajan Elementary School at Neidavasal – those of us brought up in Metropolis would not have imagined the infrastructure – it looked so ordinary. The school authorities thanked us. 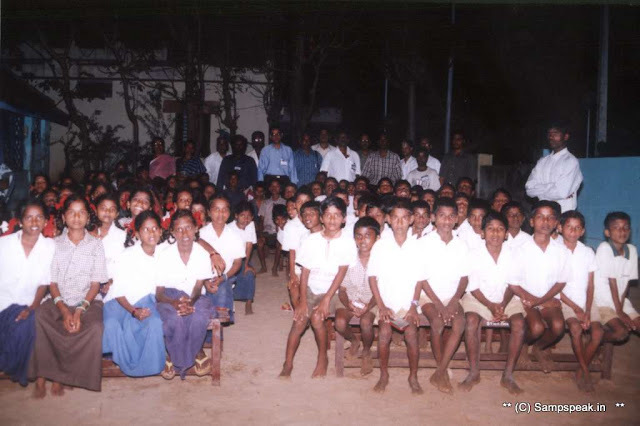 Those living in the hamlets nearer Puhar were limping back to normalcy – though we certainly wanted to avoid any form of publicity, the School management and people of the village wanted a function to be arranged for, so that they too can come out of their haunting memories and thank all those who came running from far off places extending helping hand. 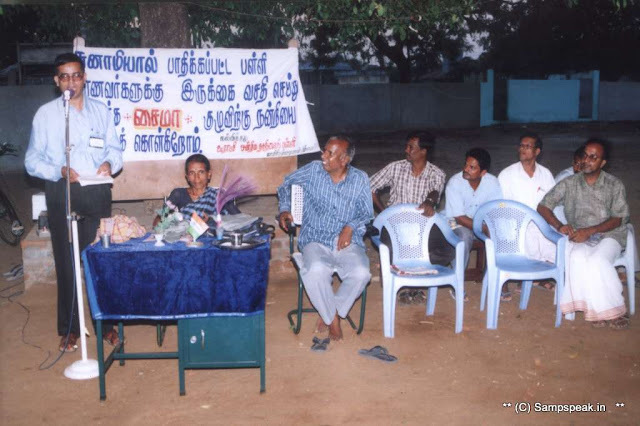 The function was held in the evening presided by Ms. Sivamanimekalai, Ooratchi Mandra Thalaivi, twice elected, she is a recipient of PM’s National Award for the best Panchayat leader. She was a very simple person dedicated to serving the people. Sri Raghavan, AEO, Sirkazhi Dist was the Chief Guest. Mr A Rajasekaran, Headmaster of Poompuhar school was also present. At the time of our visit, Sri Raghavan had close to 100 of students sitting around him and was narrating moral stories. In tune with our ideal of inculcating competitive spirit among the student, I conducted an impromptu Tamil quiz which was well received. The students who readily answered were encouraged with gifts. In the function, Headmaster and teaching staff of nearby schools, village public and many others participated. I spoke on behalf of SYMA. The village elders were to keep to thank us and shawls were presented. We had donated benches (not the desk and bench we have in our schools) – it was a primary structure of bench alone – the happiness seen on the faces of children when they sat with pride on those benches will have to be seen to be believed. Children over these sit on the floor in schools and only at higher standards have the privilege of sitting on benches ….that is our villages. Disasters are bad – they strike and damage the very roots of commoners …… sad Tsunami struck, killed people and devastated lives of thousands. It was a time when the humane face of people came out – Organisations and individuals did their mite – responding at the time of adversity. As a responsible social service Organisation, SYMA strived to do its best. For this particular trip, we have to place special thanks to Mr Biju Damodharan and staff of Al Ahlia Insurance, Oman. With regards – S. Sampathkumar. 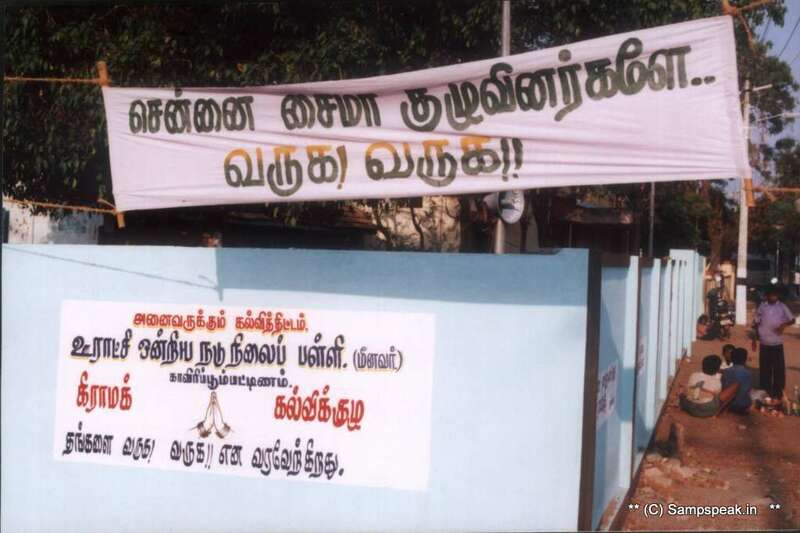 Reminiscing the relief work of SYMA when tsunami struck in 2004. Amaravati ~the new State Capital is born ! swashbuckler Virender Sehwag retires !!!!!!! Is attraction of Chennai Metro waning ?!? bagged cargo ~ jute bags scam unearthed !!! Kiwi Chris Cairns facing perjury charges !!! stolen costly cars of UK land in Uganda !! where are the young pigeons ? mother fined for eating bananas on wheel ! Giraffe in transit across Nullarbor plain ! what constitutes working hours in EU ... !!! iPhone 6 ~and the concern of left handers !! !